Australia Post customs clearance made simple. You submit online and we have it cleared in 3hrs. No Australia Post / Customs Notice? 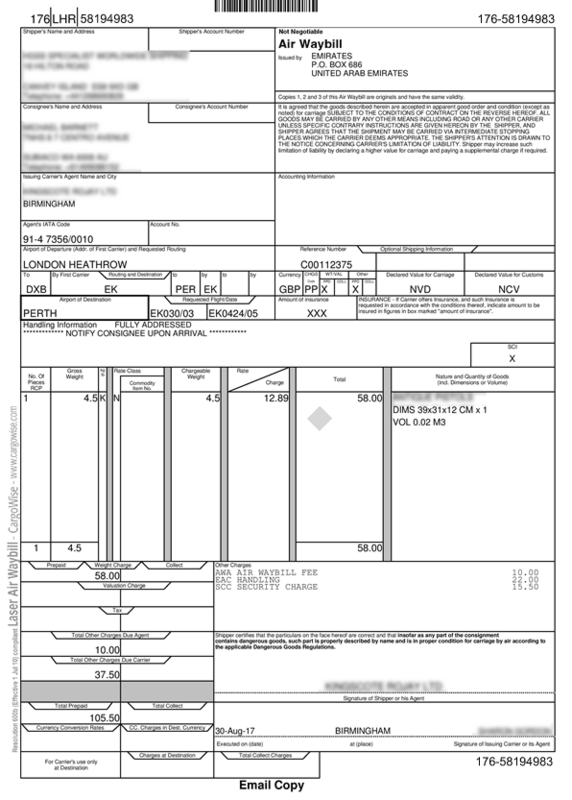 a Suppliers Receipt or Invoice and you’re done. there’s many avenues to do this. Duty and/or GST exemptions may apply. with zero duty and/or GST applicable goods. *Excludes any additional classified lines and 1.5% c/card surcharge applicable to all fees. All prices include GST. Great service....quick and very simple solution. Thank you for taking the headache away :) I will be using this company again next time. …got me out of paying any customs fee's duties or GST. eCustoms Broker always comes through for us with fast and efficient service! Thanks for always getting the job done as well as the great communication! Always a pleasure to deal with! I would highly recommend to anyone and everyone…took care of everything for me and cleared my product within a matter of hours... made the entire process quick and painless. Really fast and responsive team…they were more than accommodating. Well worth the nominal fee they charge. I just wanted to thank you for your awesome service. You were so helpful to me with all of my questions! I will definitely use you guys again & highly recommend you to others! Very impressed with how helpful and friendly eCustoms Broker was…helped me find the best option to suit my needs. Don’t waste time and money trying to clear yourself, these guys are excellent. Awesome service, friendly advice, and great to deal with. They are really helpful, and the price is the most cheapest among other broker in Australia! Really recommended. These guys are first rate who know their business…save you time and money. Every time I have used eCustoms Brokers I have had a great experience. These guys went above and beyond what they were required to do to help me… Very happy with their service and would absolutely be using them in the future. Have used eCustoms Broker multiple times now to pre-clear items coming into Australia…they make the process very quick and easy. Will definitely continue to use their services. Working eCustoms Brokers has been so smooth and efficient. The service is simply excellent! Thank you so much for your quick response and extremely fast clearance of our goods. Used eCustoms Broker to import a ring to Australia from the US and the experience was great! I would definitely use eCustoms Brokers again. Just wanted to say a massive thank you to whoever handled my consignment…I'm beyond satisfied. Extremely simple process, way faster than expected and saved me money... I am one incredibly grateful person today! Thank you times 1000! I would like to thank [eCustoms Broker]…I couldn't have done it without you...It was all easy once I got to the airport everything had been done on your side and I got my consignment in 5 minutes. The service has always been professional, friendly, and honest. In fact, [they] advised me of cheaper methods, where they could have easily made money off me instead. I highly recommend eCustoms Broker. Fantastic! Very knowledgeable and helpful. A quick call to Greg looks like saving me a few dollars unnecessary expense due to the carrier's incorrect Customs Payment Request. They are AMAZING and it’s cheaper and less stressful than doing yourself! ...I can’t say enough good things and been sharing this business source with everyone I know. We have done now over 10 imports with this agent: steady pricing and no surprises. We give a 5-star rating because they do the work you expect your customs broker to do. Do you customs clear Firearms and parts thereof? Yes, but Firearms and parts/accessories thereof require additional legislative processing which takes considerable time and therefore incurs an additional $50 processing surcharge. Just ensure you upload your import permit (if applicable) with your documentation upon online lodgement. I have multiple Tracking Numbers. That’s okay, just upload them all via the online form and our brokers will evaluate and notify you accordingly if required. I have multiple Australia Post / Customs Notices. I have multiple purchase receipts. How do I pay the Duty/GST on my goods? Once we finalise your clearance, all Customs/Government charges are automatically billed to the same credit card you used online to submit your clearance request. Can I arrange the clearance before the goods arrive? No, because we need your unique Customs Reference that’s associated to your consignment to clear your goods. This number will appear on the Australia Post / Customs Notice you receive in the mail. If the tracking shows that your consignment has arrived but you haven’t received this letter in the mail, then you can call Customs on 1300 363 262 (option 5, then 1) and request your Customs Reference, which will be a letter followed by six numbers - e.g. N123456. Once received, you can submit a customs clearance request online, just select “I did not receive this notice” when you’re prompted to provide your Australia Post / Customs Notice. Can I use eCustoms if I’ve already submitted the B374? This is a common scenario. We clear consignments electronically, therefore when Customs attempt to process your manually submitted B374, they will see that it’s already been cleared by a broker and disregard your documentation. In a worst-case scenario, if they miss to realise this and also process it, they will send you an email and at that point you need only to reply with “It’s been cleared by a broker, please disregard” and they will do so at that time. You don’t need to pay duty/GST twice. We accept Visa and Master Card, both of which attract a 1.5% processing surcharge. Unfortunately, these credit card processing fees are levied by the banks and due to our low professional fees, we are forced to pass them on. For most clients this fee translates to around $5.00. For a full list of charges you can expect to pay please see the What It Costs section above. I haven’t received your release email? If you have not received a dispatch notification email from us prior to the expiry of your service timeframe, which commences only once we’ve received all your documentation, then please check your spam/junk/deleted items folders. If you are still unable to locate it, please contact us via the below “contact us” link and include your customs reference number in the subject.  Do I need to provide my ABN if the goods are personal? Gift are treated no differently to commercial consignments, the law requires that all goods, even gifts, over the value of AUD$1000 are subject to the assessment of customs duty and GST and checked for community protection risks. The value of a gift is assessed as the usual value that you would buy that item for in the country of origin. In relation to goods imported via international post, no. You can DIY by submitting a manual B374 - Import Declaration (N10) – Post, however there are some risks. Under S.243T of the Customs Act, if you submit an erroneous declaration you can be liable for a $12,000 fine, but it gets worse… because the legislation is strict liability which means that if there’s an error, you’re liable, regardless of your intent or even knowledge of the error. Using a customs broker not only protects you from this liability risk, but in most cases, it will also save you time and money, typically more than you pay them. The bottom line is that if you’re not 100% confident that you understand the legislation and know exactly what your lodging in your declaration, use a customs broker. If your importing good via international post, then a good customs broker will save you time and money, typically more than you pay them. For example, over 83% of our clients pay less to use us than DIY lodgement of a B374 - Import Declaration (N10) – Post, and they get to snooze while it all happens. Using a customs broker also protects you from the risk of liability for lodging an erroneous import declaration, which can be anything up to a $12,000 strict liability fine. So, while it’s not mandatory to use a customs broker to clear your imported goods, in the majority of cases it’s certainly beneficial. When you import goods into Australia valued over AUD $1,000 you’re required to lodge a formal import declaration. Customs brokers electronically lodge these declarations for you to ensure your compliance with the relevant import legislation applicable to your imported goods. This covers all government legislation relating to the Department of Border Protection (DIBP – AKA Customs), the ATO, Department of Agriculture and Water Resources (DAWR – AKA Quarantine), CITES (Convention on International Trade in Endangered Species of Wild Fauna and Flora), The department of Infrastructure, Regional Development and Cities and any other relevant legislation that may be applicable to your particular imported goods. Why have my goods been stopped by Customs? 1. Have a value over AUD $1,000. 2. Contain Alcohol or Tobacco of ANY quantity or value. 3. Contain goods of Customs Interest. 4. Contain any Customs Prohibited or Restricted Imports. Note: The above is a guide only. Even if your goods do not meet any of the above criteria, Customs still maintains the right to hold and inspect any goods at their discretion. Can I track my parcel after customs clearance? Yes. 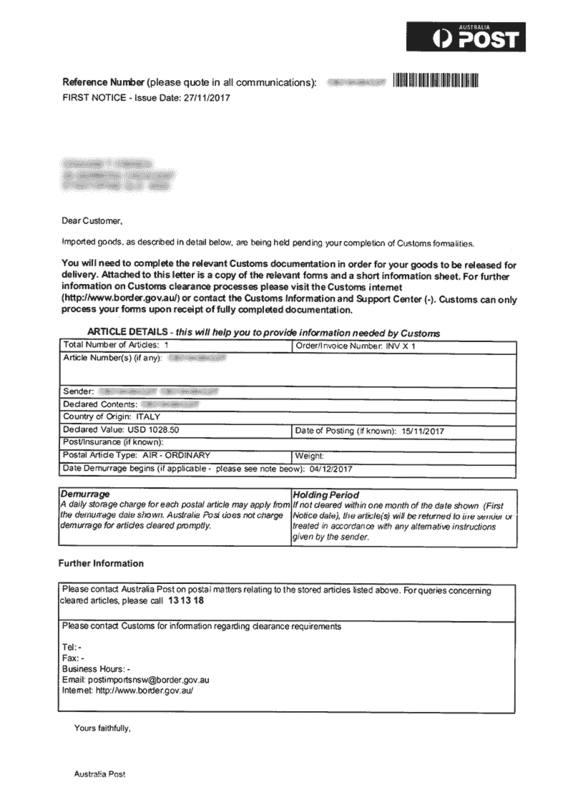 You use the same 13-digit international tracking number to track your consignments local delivery progress, however this is updated from the origin provider (and occasionally duplicated in Australia Post tracking) therefore the accuracy of such information is dependent on the origin carrier. Please Note: Until your consignment physically leaves the Australia Post bond, the international tracking system will NOT change but remain as “Held in Customs” even though we’ve already cleared your consignment. Please refer the “What Happens After Customs Clearance” FAQ for full information regarding this process and tracking statuses. Is there a local delivery cost? No. The cost of local delivery to your door has already been included in the freight charges you’ve already paid to send the goods from their origin. If you’re not home and your parcel requires a signature, then Australia Post will leave a yellow card in your letterbox and you will need to attend the post office nominated on the card to collect your consignment. Can I upgrade the local delivery to a faster service? No. Customs only “pauses” your original delivery contact with the supplier, they don’t terminate it and initiate a new one, hence your goods will continue to be delivered in accordance with the original service level contract with which they were sent from the origin. Yes. However, as we don’t have anything to do with the local delivery of your goods, you will need to call Australia Post on 13 13 18 and advise them of your new delivery address. You will need to provide them with your 13-digit tracking number which will be listed on your Customs Notice in the “Article Number” field. Can I pick up my consignment after clearance? No. Unfortunately due to the large volumes of international mail articles and Australia Post’s increased security measures they don’t allow importers to collect their parcels direct from the Australia Post bonded warehouse. You must wait for the goods to be delivered via Australia Post’s usual delivery cycles, however they will prioritise local deliveries in accordance with the service level that your goods were posted from the origin under. Hence, if your consignment was sent via international express then Australia Post will give it priority over other standard service level consignments. Once you receive the release emails from us your consignment is “Customs Cleared” and our servers automatically notify Customs of the release. Customs then generates a release report at midnight on the day of clearance which is transmitted to Australia Post at 9am the next morning. 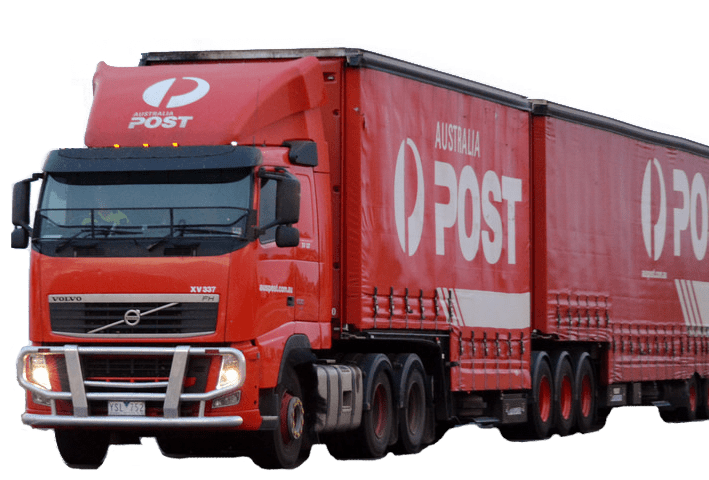 From this point Australia Post officers take your consignment out of the customs held facility and put it back in their general delivery cycle, and they quote 1-7 business days for delivery based on the service level the goods were sent from the origin on. Tracking after Customs Clearance: The international tracking system will NOT change but remain as “Held in Customs” until your consignment physically leaves the Australia Post bond. It’s up to Australia Post when they actually schedule this to occur as they are only bound to deliver your consignment within 7 business days, therefore the exact day when they commence this process after clearance notification (as outlined above) is at their discretion. It’s not uncommon that the international tracking doesn’t change for anywhere up to 3-4 business days depending on the service level that the goods were posted on as Australia Post prioritises express consignments over standard ones. If you haven’t received the consignment within Australia Posts 7 business day delivery window then you can call them on 13 13 18 and quote your 13-digit tracking number to ascertain the progress of your delivery. What is the duty/GST rates for Beer? The duty rates for alcohol varies depending on its exact specifications, however to give you a general idea most beers made from malt attract a duty rate of $49.90* per litre or alcohol content by which it exceeds 1.15%. Do goods for private use need to pay Duty/GST? Yes. The law requires that all goods – whether second hand or new, commercial or private – be subject to the assessment of customs duty and GST and checked for community protection risks. Duty and/or GST is only collected on imported goods where the value of the goods is above A$1000, OR where the goods include alcohol, tobacco or are prohibited/restricted products. Goods valued above A$1000 must be cleared through Customs by completion of a formal Customs Entry. If you have received a Customs Notice then the shipper has already advised customs that your goods meet these criteria. What is the duty/GST rates for Wine? The duty rates for alcohol varies depending on its exact specifications, however to give you a general idea most Wines are 5% duty, however in addition to duty and GST, most wines also attract Wine Equalisation Tax (WET) which is calculated at 29% of [the customs value (CV) PLUS the duty PLUS the Transport and Insurance (T&I)]. What are the duty rates for Whiskey, Vodka, Rum & Liqueurs? The duty rates for spirit alcohols vary depending on its exact specifications, however to give you a general idea spirits commonly attract the 5% duty PLUS $84.51* per litre of alcohol content. What is the duty rate for Molasses Tobacco? Tobacco duty rates vary, but the most common rate is $1,076.35*/kg of tobacco content. Molasses Tobacco is deemed to be 100% tobacco by weight, hence if you have 1kg of molasses tobacco that contains only 20% actual tobacco, you will pay $1,076.35 in duty based on a 1kg calculation of tobacco content. *Quoted rates are indicative and subject to change. What are the Tobacco duty rates? Tobacco duty rates also vary but again to give you an idea, the most common rate is $1,076.35*/kg of tobacco content. If your importing cigarettes not exceeding in weight 0.8 grams per stick of tobacco content, the duty rate is $0.80726*/stick. What exchange rate is used to calculate Duty/GST? At the time of importation, if the importer has not already transferred payment to the overseas supplier for the goods then we use the customs exchange rate, which is the average of the four major banks at the date of valuation (usually exportation date) of the goods from the origin. The Customs value of goods imported into Australia is based on the value of the goods as determined by the importers commercial invoice and is typically equivalent to the Australian currency purchase price of the goods. 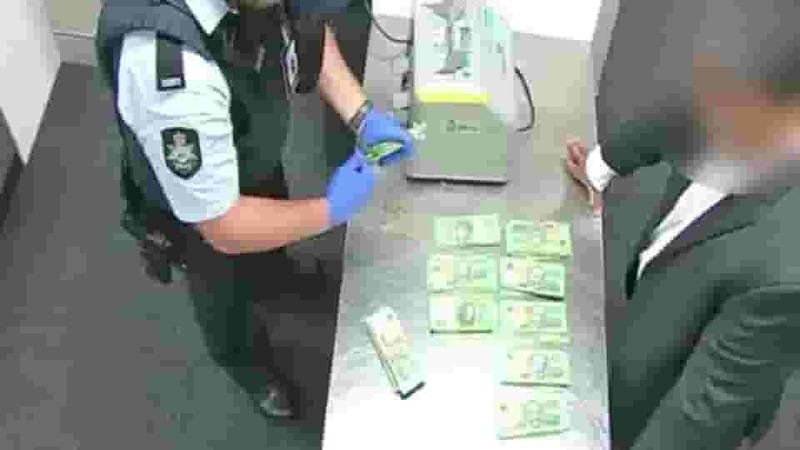 When the goods are valued at more than AUD$1000 threshold (or if they include alcohol or tobacco products of any value), a Customs value will be determined which is used as the basis for calculating the value of any duty and/or GST. The Customs value is combined with other items such as customs duty, international transport and insurance costs and, where applicable, Wine Equalisation Tax to produce the value of the taxable importation (VoTI) which is what the GST calculation is based upon. What is a ‘Tariff Classification’? The tariff classification is an 8-digit reference number and 2-digit statistical code, obtained from the Australian Customs Tariff that identifies the imported item and the rate of Customs duty that applies. Is Duty and GST payable on used goods? Why use an Import Broker? One would assume that because Customs Hose in Canberra is the departments headquarters that it’s also the most well serviced for importers, but this is not the case. While the city boasts an international airport, most cargo destined for Canberra first arrives into Sydney and is then onforwarded by domestic flights or road freight to Canberra. This is largely due to cost, it’s simply cheaper for the airlines to do this than it is to consign space on direct flights. The majority of Canberra residents and businesses we deal with are postal importers, who purchase goods online and have them shipped to Australia typically by USPS, as the US is a major Australian import origin. Due to Canberra’s relatively low population, it doesn’t have its own international mail gateway facility like the larger cities, but instead all mail articles over AUD $1000 in value are held at either the Sydney or Melbourne gateways and customs issues you a physical notice in the mail from there, requesting your completion of a “B374 - Import Declaration (N10) – Post” or assigning a customs broker to facilitate it for you. We customs clear Canberra consignments in the same manner as any other city, the only difference is that once your goods are customs released, they will be onforwarded from the aforementioned bonds for local delivery. You can still track the delivery of your consignment via the same origin providers international tracking (e.g. USPS, China Post etc.) that you’ve previously used. Some consignments (but not all) will also be transferred into Australia Post’s tracking system so you may be able to receive more detailed information from their site directly instead of relying on origin based international postal agencies like USPS as they typically don’t provide detailed tracking information after the goods have arrived in Australia. Another delivery point to be aware of is that if Australia Post is very busy, they may not begin moving your goods, hence you won’t see the tracking change (on either the origin provider’s or Australia Post’s site) for 3-4 days as it only takes them a day or two to deliver the goods to your door and the tracking won’t change from “held in customs” - even though we’ve already cleared it – until Australia Post physically scans your parcel onto their trucks departing the SYD or MEL postal gateway facilities. Melbourne importers, either as personal residents or business owners are supremely ahead of the pack - being pipped at the post only by Sydney - when it comes to Customs Brokers, Dept. 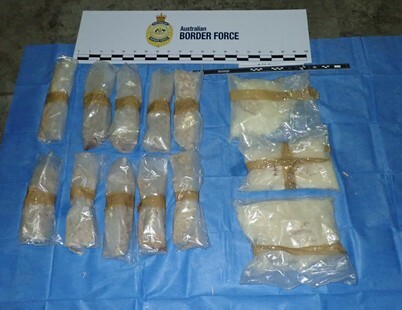 of Immigration and Border Protection (DIBP), Dept. of Agriculture (Quarantine), international trade consultancy agencies and various other import related entities. Why such a focus on Melbourne? It’s simple really, we’ve got a lot of importers here, both personal and commercial and the industry knows it, so they accommodate consumer needs accordingly. We ourselves have offices at 101 Collins Street in the city for this very reason, even though we don’t physically handle the cargo, but rather we customs clear all consignments electronically right across Australia. With around 150 international flights arriving daily there’s an enormous amount of cargo being processed, so much so that the DIBP has one of their offices located at the Melbourne Airport, and only 4 other offices spread throughout the rest of Victoria. The Melbourne postal gateway facility is also a major interchange bond, being the second largest in Australia. Other customs compliance processing such as pre-clearance intervention and manually entry processing (but not B374 - Import Declaration (N10) - Post submissions, as manual processing for these is centralised in Sydney) is handled from Customs House at 1010 Latrobe St, Docklands. This office also provides importers with national trade advice in relation to drawbacks, tariff issues such as classification, duty concessions and schedule 4 compliance, consignment valuation which incorporates all aspects of consignment definitions (that can be integral in split parcel importations), and also origin advice relating to free trade agreements, certificates of origin, bilateral economic partnership agreements and the like. Customs House Melbourne also facilitates the trusted trader scheme and issues import permits (excluding firearms, which is issued by VIC Police, CITES, DAFF and postal articles) for commercial consignments. Australia’s most livable city may also be its most importable city. With only approximately 30 international flights per day arriving into Brisbane Airport (Sydney has 110), you’ll find collections at any of the three airline bonds (Qantas, Menzies and Dnata) is a piece of cake. You’ll walk in and out in 20mins, even faster if you turn up late afternoon when all the local customs brokers and freight forwarders have already left after their second run of the day. Try that in SYD or MEL and you’ll lose all morning, first waiting in the overcrowded office queue to pay your port charges and then, with collection ticket in hand, in another queue waiting for the forklift drivers to load you. If you’re a postal importer, then the Brisbane customs bond is also a cut above the rest. When a client calls us in urgent need of their imported medical equipment (customs won’t even consider to accommodate anything else) and asks if there’s any way they can collect it from the Customs Bond today instead of waiting for Australia Post to deliver it, our first question is always the same… “Are you in Brisbane?” Because if you’re not, then you’ve got Buckley’s. Customs processes some 170,000 postal articles per day throughout Australia and with Brisbane being their 3rd largest facility, the Eagle Farm gateway is hectic indeed, yet even so the customs staff there seem to be simply more obliging than at other facilities. Maybe it’s the fresh clean BNE air, but there’s definitely a difference, at least in our experience. In the past 17yrs of clearance processing Brisbane destination cargo, we’ve found this city’s Customs, Quarantine and even Airline bonds facilitators to be some of the most accommodating in Australia, second only to the Gold Coast and possibly Perth. Obtaining Customs Releases in Perth – Narrowly following Brisbane, but only just. As a nationally licensed customs brokerage, we do exactly the same in-house electronic clearance processing regardless of whether the cargo destination is Perth (PER), Adelaide (ADL), Newcastle (NCL) or any other Australian city for that matter. The difference we find in client locations is in regards to the processes that occur outside of our sphere of control, like airport staff that you may need to deal with upon cargo collection, or customs/quarantine (and about a dozen other government departments) that we as your customs brokers liaise with on your behalf. If you live in Perth then you’re already a step ahead of most other Australian locations, with the close exception of Brisbane and the Gold Coast, in regards to the expedience, flexibility and just general ease of dealings with these external organisations. We’ve found Perth based clearance operations officials are not just more helpful but typically even friendlier than the dealings we’ve had with their counterparts in say Sydney. It may be that we have just experienced a poor sampling of these larger eastern state’s officials or the hectic day to day operations of these mega bonds doesn’t allow time for the niceties anymore, but considering that we’ve been doing this for almost two decades now, and we ourselves are Sydney based, it may just be the fresh Perth air that makes all the difference. Either way, it seems to be all positive for Perth residents in the customs and freight forwarding industry. For example, if you’ve got a consignment that you need to collect from one of the PER airline cargo bonds (Qantas, Menzies Aviation and Dnata), and you’re a few days late due to an unforeseen customs hold on your consignment, you’ll likely find that a simple explanation of the circumstances surrounding your delay in collection will result in them waiving your storage and saving you several hundred dollars. Try this at Sydney or Melbourne and you’ll almost certainly be read their storage policy clause relating to their lack of liability for customs instigated holds, and be forced to pay the money if you want your goods. This is simply the commercial reality that we’ve experienced over the past 17yrs of clearing cargo in Australia. Adelaide Customs Clearance – A walk in Victoria Park. Our customs brokers clear Adelaide destination consignments for both direct airfreight and Australia Post consignments in exactly the same manner as we do Sydney cargo, where our offices are. This is because everything is electronic these days, so most brokerages don’t physically interact with the cargo anymore, we receive your documentation electronically via your online submission or by email. We process your clearance via direct liaison with the Integrated Cargo System (ICS) which is the Australian government’s national customs and freight movements electronic monitoring infrastructure and consignment release system. Then, depending on how your international consignment arrived in Australia, one of the two following processes occur. If they arrived via international post, you’ll receive the release emails from us which include a copy of your customs entry and full instructions outlining the next movements of your goods. Once customs cleared, Australia Post is responsible for the local delivery and they assign a 1-7 business day window to move the cargo from the international postal facility, which for Adelaide bound cargo will typically be Sydney or Melbourne, to your door. They prioritise these deliveries based on the service level that your goods were consigned under from the origin, so if your consignment was sent by express post then you can expect it to be delivered in the lower half of that delivery window, if they were sent standard then it will likely be the higher side. You can usually track its post-clearance local delivery progress via the origin postal service providers website and also sometimes (but not always) directly via Australia Post’s tracking. If your goods arrived on an international cargo flight through one of the major airlines like Qantas, Emirates or Singapore Airlines, then we email you full customs clearance documentation and collection instructions and you collect the goods directly from one of the three airfreight cargo bonds, which are all located at the Adelaide airport. We take great delight in facilitating customs cargo clearances for Gold Coast residents and businesses because a broker’s job is made significantly easier when the airline cargo freight bond’s they need to deal with are efficient and well trained in all aspects of the customs and quarantine formalities. Fortunately for us, most Gold Coast destination cargo is handled by the Coast Cargo bond at Coolangatta, a facility whose staff are most certainly knowledgeable and also very proficient at their jobs. They typically notify us of arriving client’s cargo early morning on the day of flight arrival, sometimes before the aircraft has even landed. This means that our clients can collect their goods the same afternoon. Most other bonds notify us late afternoon, or even on the second day meaning our client’s collections are often delayed. We always have all airfreight clearances completed within 4hrs of the clients online lodgement (assuming they’ve provided the correct documentation of course – which is typically just an air waybill and their suppliers invoice), so any collection delays typically only hinge on the airline cargo handler’s ability to unload the aircraft and check-in your cargo in a timely manner, which (at least from our experience) is something that the Gold Coast’s primary freight facilitators do very well indeed. The standard timeframe for check-in processing is 6hrs after flight arrival but Coast Cargo usually has it done within 3-4, well below the industry average, another reason why they’re a pleasure to deal with for us. Certain airlines also utilise Coolangatta as an international first arrival airport for their Brisbane destination cargo, which means that Coast Cargo unloads the aircraft and road freights it to a BNE cargo bond, usually Menzies Aviation. Again, they’re quite impressive in these regards, generally dispatching the freight the same day, and although this is not influential for Gold Coast importers, it does server to further attest to the bond’s diligence in all facets of import cargo operations. Efficient customs clearances in Newcastle are a painless experience. As Australia’s premier online brokerage, we customs clear all airfreight and postal cargo arriving into Newcastle, and you can get it done while you’re sitting on our beautiful Newcastle beach with nothing more than a mobile phone in your hand. If you’ve got an airline cargo consignment, you can just submit a clearance request online by uploading your suppliers’ invoice and Air Waybill (both of which your supplier should have emailed you) and we do the rest. So you can sit back and work on your tan while we jump through all the compliance hoops for you. It’s quite literally that easy. Once your clearance has been finalised we’ll email you the customs release documentation along with full instructions for you to collect the goods. So, it’s time to pack up your towel and sunscreen and head off down to the airport at Port Stephens, just 25mins drive away. Or if you still feel that you need some more rays, you can book a courier to collect the goods on your behalf, and our release emails even provide you guidance for such 3rd party collections if your too busy. If picking up your cargo seems like too much of a hassle for you (which is certainly understandable when you’re living in one of Australia’s premier relaxation spots), then you can instruct your supplier to send the goods via the international postal system. For these importations, when your goods arrive at the Sydney gateway facility, you’ll get a letter in the mail from Customs advising you of that they’ve been held pending customs clearance. You can manually lodge a B374 - Import Declaration (N10) – Post yourself or engage a Newcastle servicing customs broker to do it for you. If you want to get your goods 10 days earlier and skip all the hassle of DIY, you just follow the same processes as you would with direct airfreight cargo and submit your clearance request online, uploading the letter customs sent you and your suppliers’ invoice and you’re done in less than 5 minutes. We get your consignment cleared and Australia Post delivers it to your door. With the large volumes of cargo travelling daily to Newcastle, your consignment would typically be at your local onforwarding post office just a few hours after it’s dispatched from the Sydney international mail sorting facility. How Did Your Goods Arrive? over A$1,000 require Customs Clearance. you’ll need a Postal Customs Clearance. you’ll need an Airline Cargo Clearance.